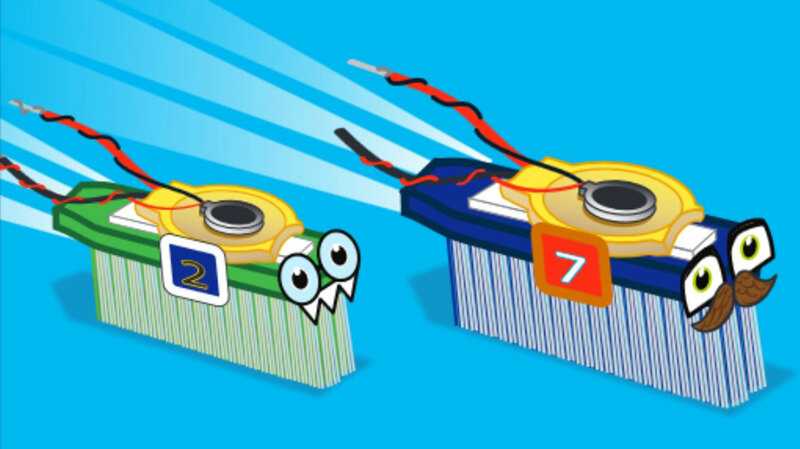 Decorate your brushbot with numbers, teeth, eyes (sure, the googly kind) or even a moustache! The Brushbot Party Pack is a fun way to upgrade your kid's next party. In a few quick steps, turn the 12 toothbrushes, motors and batteries in the kit into buzzing, twirling "bots" that can be customized with goofy decals and numbers that are included. The toothbrush head acts as the body with hundreds of tiny legs that send the BrushBots jiggling and bumping on their way. Included in your party pack is a BrushBot mini-comic, instructions on how to build a racetrack, and a MAKE pin to hand out to race winners or creators of the wackiest bot. You can also print out a downloadable colorful BrushBot party invitation (see below). Let the race begin! This kit is not for speedy tooth brushing and includes small parts not intended for children under 3 years.